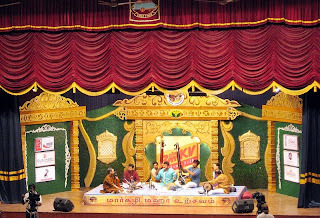 Carnatic music concerts are no more in 'the same old' format. They are now set in themes. Many of the themes are chosen by the organisers, who do a bit of research to know who is the best to present specific themes. But some are left to the artistes, who do their homework to bring out their strength out in the open. Jaya TV's Margazhi Maha Utsavam this year has various themes celebrating different things and moods. From a straight forward theme like 'Celebrating D.K. 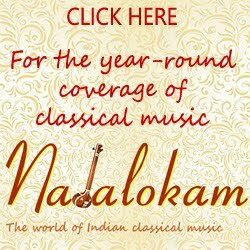 Pattammal' by her granddaughter Nithyasree and 'Celebrating Earth, seasons and festivals' by the violinists duo Ganesh and Kumaresh to intriguing themes like 'Celebrating Myriad Hues of Ragas' by S. Sowmya, the list is long. The one which made many eyebrows raise was a theme and name - 'Celebrating Suspense' - given to T.M. 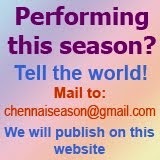 Krishna's concert on Dec. 4. The auditorium inside Chettinad Vidyashram School began getting filled up by 5.30 p.m. when Gayathri Girish was singing her main piece. When it was time for Krishna's concert at 6.30 p.m., the gallery in the upstairs was also 75% full. Many were curious and waiting for Krishna to reveal the 'suspense'! Krishna said 'Namaskaram' with a mischievous smile and expressed his 'surprise' over the theme printed on the Jaya TV's event invite. "I never expected that the organisers would mention the theme as 'Celebrating Suspense' in their press releases and invites!'' He continued to say that he could not find an apt name for the set of songs he selected for that day and so he called it a suspense and wanted the rasikas to assist him in giving a theme name at the end of the concert. The concert began with the song 'Anbe Jeevadharam' in the raga Bahudari composed by 'Spencer' Venugopal and in Tamil. The next was from a Kannada poetry collection on winter season followed by a Malayalam piece from Mayura Sandesham. Krishna said that this piece was set to tune by Sangeetha Sivakumar. Then came 'Kathamaham varnayami ramyalila' a composition in Sanskrit. He announced, "This is a composition of R.K. Sriram Kumar, my close friend." After a Bengali song from Rabindra Sangeeth, Krishna wrapped up the concert with Subramanya Bharati's 'Chinnanjiru kiliye' again in Ragamalika but with a different set of ragas. It was time for the question hour. When the audience started moving, the organisers requested them to stay back at least for the first question, as the reply to the question will be a surprise. "This team of T.M.Krishna, R.K. Sriramkumar, Arun Prakash, and Purushotham is a powerful team. Can we have four lines of a mikeless singing?" was the question. Krishna's team was game to respond and the mikes were muted. Then came the real surprise. Krishna sang 'Modi jesa velara', the Khamas raga javali in the fast pace. The team proved that it was really a powerful one. But what was the theme 'suspense'? Krishna finally declared that he gave the title for the theme of his songs presented, 'Bhakthi'. Anything that has to do with devotion irrespective of whether it is love, affection, celebration... is Bhakthi! Nice blog. The article you have shared is good.This article is very useful. My friend suggest me to use this blog. I am writing thesis on the topic climate change and global warming essay writing service reviews. Thank you for sharing.